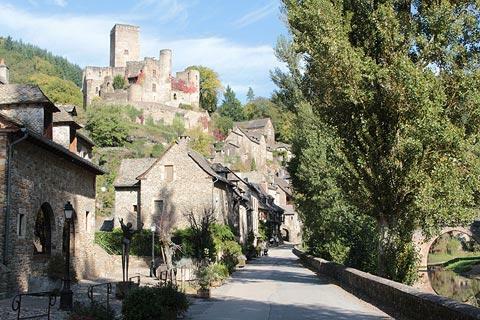 The village of Belcastel, listed as one of the 'most beautiful villages of France', is about 20 kilometres west of Rodez in the north-west of the Aveyron department. The story of the rebirth of Belcastel is interesting. During the 1970's the castle was acquired and meticulously restored. This then motivated the rest of Belcastel to beautify themselves, mostly during the 1980's. 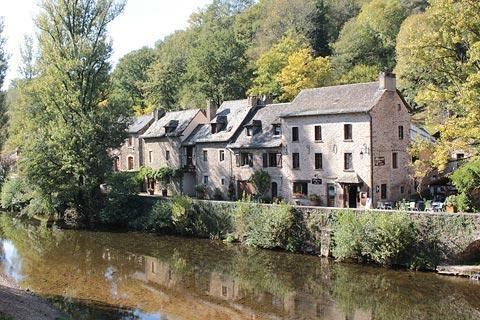 Perhaps this in part explains Belcastel's 'perfection' - although it avoids the 'too perfect' look of some of the 'most beautiful villages'. 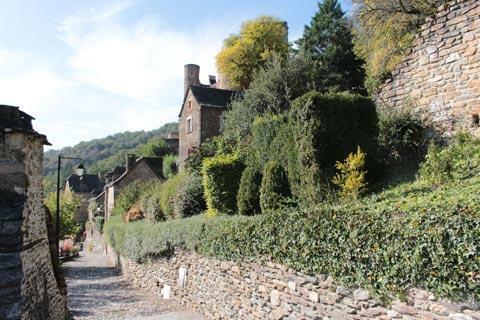 Start your visit by parking in the car park on the eastern edge of the village: the steep streets of the historic centre are not suitable for exploring by car! 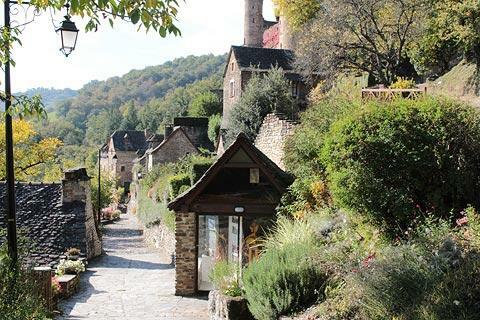 Walking into Belcastel from here you have lovely views along the river to the right and old stone houses along the left side. 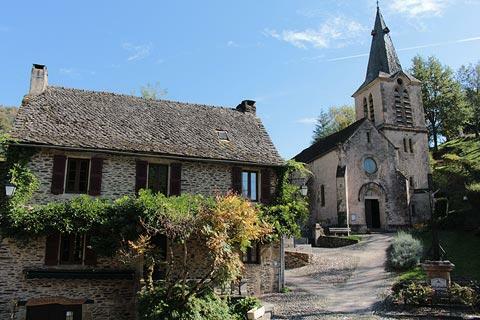 It is also here that you can find the small museum in Belcastel, the Maison de la Forge, dedicated to the trades that have been traditionally carried out in the village. 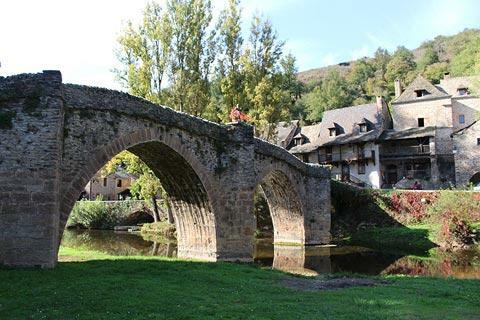 In the centre of Belcastel the river is crossed by a very attractive stone bridge, narrow with five arches, built by the same person who founded the church at the far end of the bridge. 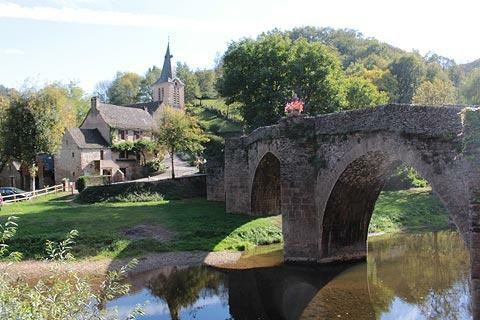 Both of these historic monuments date from the fifteenth century. Inside the church there are some ancient statues including a recumbent stone carving of Alzias de Saunhac and a statue of Saint-Christopher. 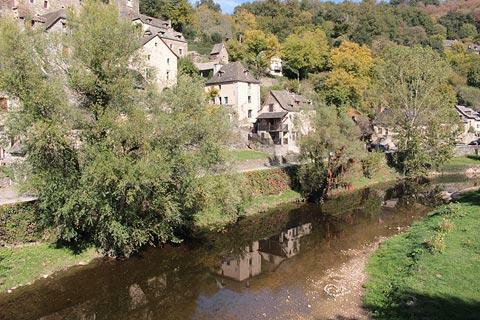 There is a lovely view from the bridge of the ancient houses, up the steep hillside between the river and the castle. 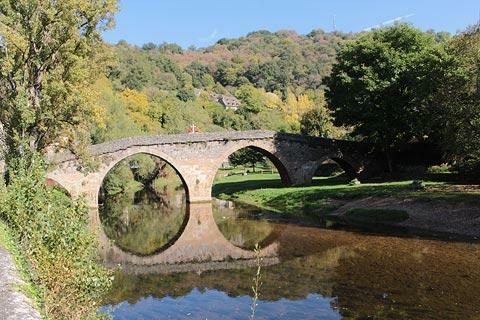 There is also a popular picnic area across the bridge in Belcastel, between the church and the river. 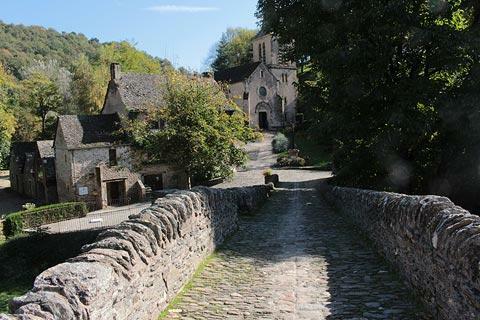 You will now want to explore the pretty, narrow cobbled streets of the village. 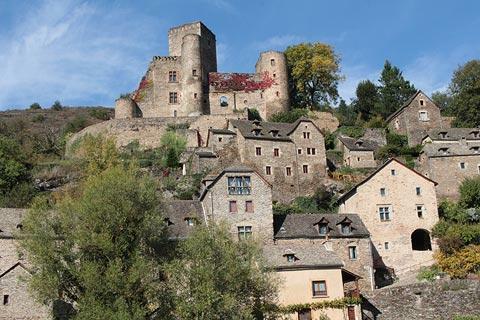 Many of the houses in Belcastle have a great deal of character, most notable for their stone (lauze) rooves, and it is a pleasure to explore and very straightforward: there are only two narrow roads and they both lead up the hill to the castle. 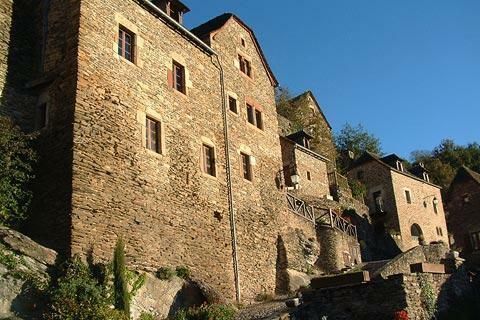 At the highest point in the village, Belcastel castle has overlooked the village since the 11th century. A chapel previously stood on the same site from the 9th century onwards. 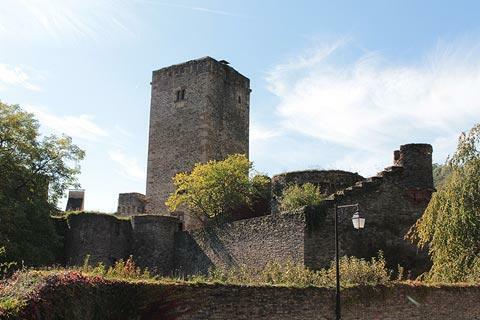 For several centuries the castle was home to various noble families until it was abandoned in the 16th century. It remained empty until its acquisition and renovation in the 1970's by the architect Fernand Pouillon, from his own funds. The castle is open to the public and is interesting both for the characteristics of the medieval castle itself such as the moats and the keep and the medieval armour on display, the views from the castle, and because of the exhibitions of modern art that are displayed (some permanent and some temporary) in both the rooms of the castle and in the adjacent gardens. 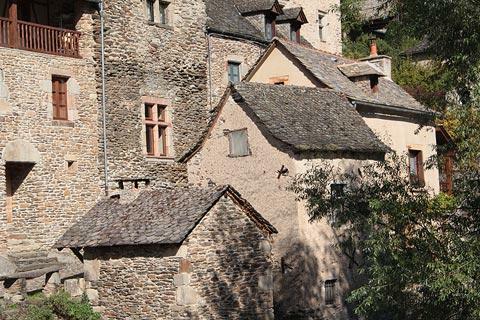 The Château de Belcastel is open to visitors from April to early November. About one kilometre from Belcastel (follow the road next to the church) at the Roc d'Anglars you can see the remains of an old fort. 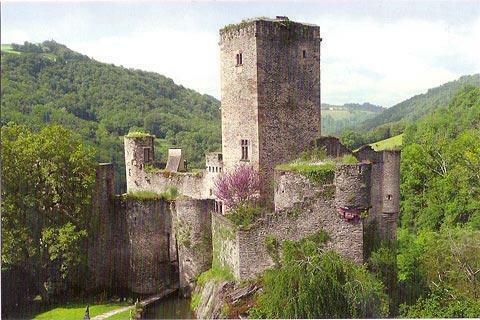 This is thought to date from the 5th century, so is one of the oldest castles in France. 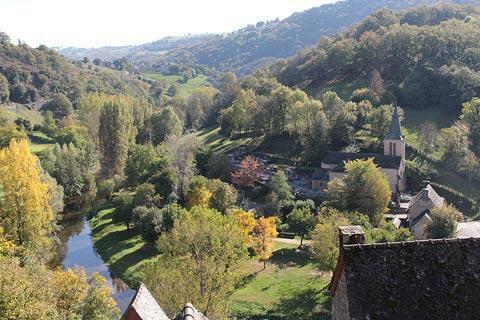 Nearby don't miss the chance to visit Conques, another exceptionally beautiful village. 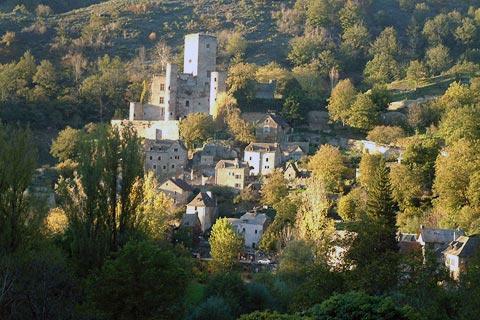 Among our other favourite towns in the region are Najac and Peyre. 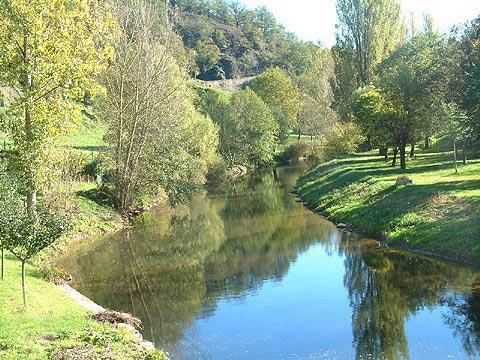 Among the many picturesque towns in the region around Belcastel we also highly recommend you visit Figeac. 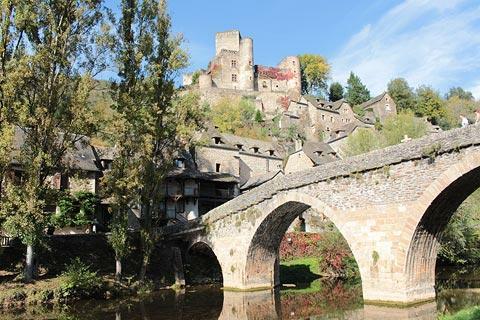 Although it is about 40 kilometres from here (several other market towns are closer to Belcastel) Figeac has one of the most impressive historical centres in France.